Back to school, kiddos! Here’s the latest news from our esteemed alumni – the past awardees of our Artist Fellowships Program. The Massachusetts Cultural Council (MCC) and the New Art Center in Newton (NAC) join together to present the MCC Artist Fellows in Painting, Choreography, Drawing & Printmaking, and Traditional Arts (9/16-10/15, opening reception 9/16, 6-8 PM). The exhibition will feature: in Painting – Dennis Congdon, Nicole Duennebier, Raúl Gonzalez, Joel Janowitz, Catherine Kehoe, Andrew Gordon Moore, and Cristi Rinklin; in Drawing & Printmaking – Kim Carlino, Erica Daborn, Linda Etcoff, Kevin Frances, Emily Lombardo, Stephen Mishol, and Ethan Murrow; in Choreography – Dahlia Nayar, Candice Salyers, and Sara L Smith; and in Traditional Arts – Dimitrios Klitsas. MCC Choreography Fellow Candice Salyers will perform and literary awardees Jane Dykema, Michael Lowenthal, Shubha Sunder, Sheryl White, and Kris Willcox will read at the New Art Center (9/30, 6:30 dance performance, 7 PM reading). Look for more readings by MCC literary Fellows/Finalists in the months ahead. Elizabeth Alexander has a solo show, I May Not Be a Lion exhibiting at Elon University in North Carolina (thru 10/6). Watch her artist talk about the show. Also, she is in the group exhibition For the Saturday Evening Girls at Drive-By Projects (9/17-10/29, opening reception 9/17, 4-6 PM). Marilyn Arsem performs as part of the Arctic Action: International Action Art Festival in Svalbard, Norway (9/19-9/28). Sarah Bliss co-created a site-specific 16mm film sculpture-installation, pump, filter, reflect, with Chrissy Hunt and Anto Astudillo, and it will be featured in Temporal Currents, a one-night-only live experimental film and sound event at Boston;s Metropolitan Waterworks Museum, featuring filmmakers from the AgX Film Collective and musicians from NonEvent. John Cameron is in two exhibitions this month: Furniture Masters 2016: Distinctive at 3S ArtSpace in Portsmouth, NH (thru 9/25, Main Event on 9/25). Also, a showcase of work by recent exhibitors at the Smithsonian Craft Show, called D.C. Current, exhibits at the Center for Furniture Craftsmanship in Rockport, Maine (9/23-1/4, opening reception 9/23, 5-7 PM). Stephen DiRado has been selected to receive the 35th ArtsWorcester Award (9/9, 6 PM), given annually to an individual who has made exceptional contributions to the artistic and cultural life of this city. William Giraldi publishes a new memoir this month, The Hero’s Body. He’ll read from the book at Harvard Book Store (9/10, 7 PM). Kelly Goff‘s installation Dumpster was featured in an article in the arts journal Hyperallergic about the 2016 Governor’s Island Art Fair. Sean Greene is exhibiting in a two-person show (with Jen Simms) at Mingo Gallery in Beverly (thru 10/8, opening reception 9/9, 6 PM). He’s also in a group show at Mount Holyoke College Blanchard Gallery (thru 9/15, opening reception 9/8, 5:30 PM). Colleen Kiely has drawings in About Face at UMass Amherst’s Augusta Savage Gallery (9/12-9/28). Jesse Kreitzer‘s film Black Canaries was awarded the Vermont Symphony Orchestera’s VSO Award for Best Integration of Music into Film at the Middlebury Filmmakers Festival. The film also received Grand Jury Awards for “Best Short Film” and “Best Cinematography” at the 12th Annual HollyShorts Film Festival in Hollywood, California. Danielle Legros Georges takes part in Living in Many Languages: Poetry And Music to Celebrate the Act of Translation at Dewey Square Parks (9/2, 2 PM). She’ll also read as part of the ICA Boston’s Powerful Words, an evening of readings, reflections, and community in response to violence, racial injustice, and trauma (9/8, 6 PM). Sandy Litchfield has a solo show, Deciduious City, at Carroll and Sons Gallery (9/7-10/1, opening reception 9/9, 5:30 PM). Tara Masih is the Series Editor for the annual Best Small Fictions series, which just published the 2016 edition. Rania Matar exhibits her new photography series Invisible Children, capturing the portraits of young Syrian and Palestinian refugees in Lebanon, at C. Grimaldis Gallery in Baltimore (9/15-10/22, opening reception 9/15, 6-8 PM). Caitlin McCarthy has essays in two upcoming nonfiction anthologies from McFarland & Company: She Loves You: Women Writers Tell How a Teen Idol Changed Their Life and Soap Opera Confidential: Writers and Soap Insiders on Why We’ll Tune in Tomorrow. Also, her script Wonder Drughighlighted in an article in Collective Evolution. Richard Michelson is publishing a new children’s book, Fascinating: the Life of Leonard Nimoy. There will be a Publication Party and Book Signing (9/9, 6-8 PM) in conjunction with the opening of UNSEEN: Fifty Never Before Exhibited Photographs, in honor of the 50th Anniversary of Star Trek, at R. Michelson Galleries. Nathalie Miebach is in a group show, Encircling the World: Contemporary Art, Science, and the Sublime at the Massachusetts College of Art and Design Bakalar Gallery (9/19-12/3, opening reception 9/19, 6-8 PM). Ethan Murrow has a solo show of drawings, Water Almanac, at Winston Wächter Fine Art in NY (9/8-10/29, opening reception 9/8, 6-8 PM). The artist utilized portions of his MCC grant to support the creation of art for the show, which features drawings based on the Farmers Almanac. Lisa Olivieri screens her film Blindsided at the Firehouse Center for the Arts in Newburyport (9/18, 12 PM). Q&A with the director to follow screening. Monica Rayond‘s play A to Z was a finalist for both the Jane Chambers Award and ATHE Award for Excellence in Playwriting. Paper of Plastic, a short opera for which she wrote the libretto (music, Charles Turner), won second prize in Opera Kansas’s short opera competition. Marian Roth has a solo exhibition, Marian Roth: The Mysterious World of the Camera Obscura, at the Griffin Museum of Photography (9/8-10/2, talk and reception 9/15, 5-8 PM). Eric Henry Sanders will have a reading of his new play Where’s Annie? at the A.P.E. Gallery in Northampton (9/17, 7:30 PM). Congratulations to Karen Skolfield, named a runner-up in the The Iowa Review’s Jeff Sharlet Memorial Award for Veterans writing contest. Five of her poems will be published in the Spring 2017 issue of Iowa Review. This month, she’s participating in events surrounding the Amherst Poetry Festival and Emily Dickinson Poetry Marathon 2016 (9/15-9/17). Peter Snoad‘s short play Bull will be produced by The Landing Theatre in Houston as part of its Redemption series (9/21-10/3). The play is about the love/hate relationship of two New York City cops with Arturo DiModica’s iconic statue of the Charging Bull which they’re guarding during the Occupy Wall Street protests. Naoe Suzuki, currently artist-in-residence at the Broad Institute, will have a public dialogue with Broad Institute founding core member Tod Golub called Collaborating at the Intersection of Art and Science (9/27, 3-4 PM). Scott Wheeler composed the music for Naga, one of the three operas performed as part of the Ouroboros Trilogy at ArtsEmerson (9/10-9/17). 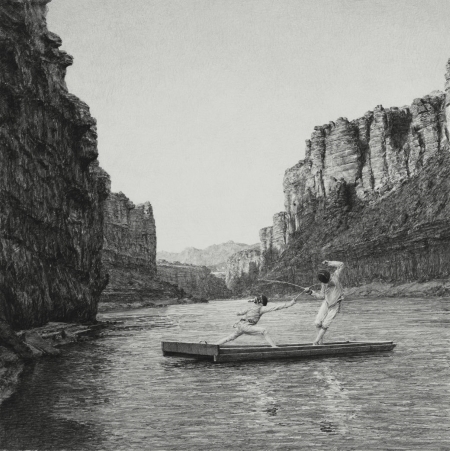 Image: Ethan Murrow (Drawing & Printmaking Fellow ’16), RIPARIAN LAW (2016), graphite on paper, 36x36in.